Maryanne with Anaïs last dog Piccolino. 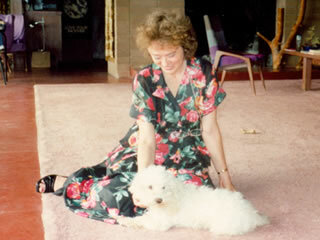 Photo was taken at her house in Siverlake. I will always remember the first time I saw Anaïs Nin. It was the Spring of 1974 and we were at 3 Washington Square Village, New York City. When she opened the door it was all I could do to keep from staring. Here was the most beautiful woman I’d ever seen in my life. Anaïs Nin was wearing a soft, velvet, floor length, aquamarine gown that accented her fragile, mysterious air, her warmth, her physical loveliness. Of course I had seen photos, taken I had assumed when she was a very young woman. But I knew she was seventy and it didn’t seem possible that she could have kept all of her youthful glow, vitality and fascinating Greta Garbo beauty. Surely this woman had the secret for remaining young in every possible sense of the world. The later conversation proved this so. She ushered us into her room while she went to the kitchen to prepare tea. The room echoed her enchanted beauty, rich lavenders, soft sea greens and blues, fabulous Indian multi-colored mirrored pillows. Everything reflected her gracious simplicity, taste, love of life and beauty. Meeting this woman I had come to know and love through her works was one of the most exciting moments of my life and yet she made me feel at home immediately. The whole atmosphere was one of meditation, comradeship, openness, calm. The more time I spent with her the more I fell in love with her. This was the woman I wanted to become, and yet when I meet someone I admire so much ordinarily I’m so taken back by that person I begin to feel self conscious. But I too was born under the sign of Pisces, and I shared her favorite colors, her interest in Astrology, dance, literature and dreams. Rather than feeling incompetent, I felt I was on the ladder climbing towards becoming as much as possible like this woman whom I admired so much. She transcends death because she was so alive when she lived. She was mystery, generosity, love, sensuality, passion and creativity. If you were her friend, she was as close to you as your own mind, and as mysterious. Part of this appeared in Under the Sign of Pisces: Anaïs Nin and her Circle, Summer 1979 and again in Anaïs Nin: A Book of Mirrors. I made several changes.